A baluster—also called spindle—is a moulded shaft, square or of lathe-turned form, cut from a rectangular or square plank, one of various forms of spindle in woodwork, made of stone or wood, and sometimes of metal or plastic, standing on a unifying footing, and supporting the coping of a parapet or the handrail of a staircase. Multiplied in this way, they form a balustrade. Individually, a baluster shaft may describe the turned form taken by a brass or silver candlestick, an upright furniture support, or the stem of a brass chandelier, etc. 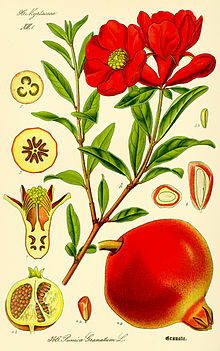 According to OED, "baluster" is derived through the French: balustre, from Italian: balaustro, from balaustra, "pomegranate flower" [from a resemblance to the swelling form of the half-open flower (illustration, below left)], from Latin balaustium, from Greek βαλαύστιον (balaustion). The earliest examples are those shown in the bas-reliefs representing the Assyrian palaces, where they were employed as window balustrades and apparently had Ionic capitals. As an architectural element the balustrade did not seem to have been known to either the Greeks or the Romans, but baluster forms are familiar in the legs of chairs and tables represented in Roman bas-reliefs, where the original legs or the models for cast bronze ones were shaped on the lathe, or in Antique marble candelabra, formed as a series of stacked bulbous and disc-shaped elements, both kinds of sources familiar to Quattrocento designers. The application to architecture was a feature of the early Renaissance: late fifteenth-century examples are found in the balconies of palaces at Venice and Verona. These quattrocento balustrades are likely to be following yet-unidentified Gothic precedents. They form balustrades of colonnettes as an alternative to miniature arcading. Rudolf Wittkower withheld judgement as to the inventor of the baluster and credited Giuliano da Sangallo with using it consistently as early as the balustrade on the terrace and stairs at the Medici villa at Poggio a Caiano (c 1480), and used balustrades in his reconstructions of antique structures. Sangallo passed the motif to Bramante (his Tempietto, 1502) and Michelangelo, through whom balustrades gained wide currency in the 16th century. Wittkower distinguished two types, one symmetrical in profile that inverted one bulbous vase-shape over another, separating them with a cushionlike torus or a concave ring, and the other a simple vase shape, whose employment by Michelangelo at the Campidoglio steps (c 1546), noted by Wittkower, was preceded by very early vasiform balusters in a balustrade round the drum of Santa Maria delle Grazie (c 1482), and railings in the cathedrals of Aquileia (c 1495) and Parma, in the cortile of San Damaso, Vatican, and Antonio da Sangallo's crowning balustrade on the Santa Casa at Loreto installed in 1535, and liberally in his model for the Basilica of Saint Peter. Because of its low center of gravity, this "vase-baluster" may be given the modern term "dropped baluster". The baluster, being a turned structure, tends to follow design precedents that were set in woodworking and ceramic practices, where the turner's lathe and the potter's wheel are ancient tools. The profile a baluster takes is often diagnostic of a particular style of architecture or furniture, and may offer a rough guide to date of a design, though not of a particular example. Some complicated Mannerist baluster forms can be read as a vase set upon another vase. The high shoulders and bold, rhythmic shapes of the Baroque vase and baluster forms are distinctly different from the sober baluster forms of Neoclassicism, which look to other precedents, like Greek amphoras. The distinctive twist-turned designs of balusters in oak and walnut English and Dutch seventeenth-century furniture, which took as their prototype the Solomonic column that was given prominence by Bernini, fell out of style after the 1710s. Once it had been taken from the lathe, a turned wood baluster could be split and applied to an architectural surface, or to one in which architectonic themes were more freely treated, as on cabinets made in Italy, Spain and Northern Europe from the sixteenth through the seventeenth centuries. Modern baluster design is also in use for example in designs influenced by the Arts and Crafts movement in a 1905 row of houses in Etchingham Park Road Finchley London England. Outside Europe, the baluster column appeared as a new motif in Mughal architecture, introduced in Shah Jahan's interventions in two of the three great fortress-palaces, the Red Fort of Agra and Delhi, in the early seventeenth century. Foliate baluster columns with naturalistic foliate capitals, unexampled in previous Indo-Islamic architecture according to Ebba Koch, rapidly became one of the most widely used forms of supporting shaft in Northern and Central India in the eighteenth and nineteenth centuries. The modern term baluster shaft is applied to the shaft dividing a window in Saxon architecture. In the south transept of the Abbey in St Albans, England, are some of these shafts, supposed to have been taken from the old Saxon church. Norman bases and capitals have been added, together with plain cylindrical Norman shafts. Balusters are normally separated by at least the same measurement as the size of the square bottom section. Placing balusters too far apart (to save money) diminishes their aesthetic appeal. Balustrades normally terminate in columns, building walls or more properly in heavy newel posts because otherwise they will not be structurally strong enough. Balusters may be formed in several ways. Wood and stone can be shaped on the lathe, wood can be cut from square or rectangular section boards, while concrete, plaster, iron, and plastics are usually formed by molding and casting. Turned patterns or old examples are used for the molds. A vasiform balustrade crowns Michelangelo's Palazzo dei Conservatori on the Campidoglio, Rome. 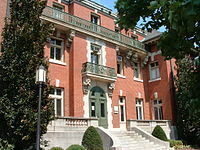 Brown University's Orwig Music Library features an ornate balustrade. The word banister (also bannister) refers to the balusters of a stairway. It has been defined as either a handrail, especially on a staircase, or such a handrail together with its supporting structures. ^ Cast-stone balusters were a development of the 18th century in Great Britain (see Coade stone), cast iron balusters a development largely of the 1840s. ^ a b c d One or more of the preceding sentences incorporates text from a publication now in the public domain: Chisholm, Hugh, ed. (1911). "Baluster" . Encyclopædia Britannica. 3 (11th ed.). Cambridge University Press. p. 297. 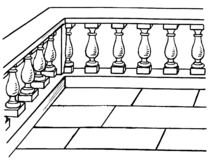 ^ "A row of balusters surmounted by a rail or coping" 1644. OED; "AskOxford". Archived from the original on 2007-09-29. Retrieved 2007-06-26. ^ The early sixteenth-century theoretical writer Diego da Sangredo (Medidas del Romano, 1526) detected this derivation, N. Llewellyn noted, in "Two notes on Diego da Sangredo: 2. The baluster and the pomegranate flower", in Journal of the Warburg and Courtauld Institutes 40 (1977:240-300); Paul Davies and David Hemsoll's detailed history, "Renaissance Balusters and the Antique", in Architectural History 26 (1983:1–23, 117–122) p.8 notes uses of the word in fifteenth-century documents and explores its connotations for sixteenth-century designers, pp 12ff. ^ Davies and Hemsoll 1983:2. ^ A colonnette is a miniature column, used decoratively. ^ Davies and Hemsol 1983 note the earliest uses of both types of baluster in fictive classicising thrones and architecture in paintings. They instance an earlier use in real architecture on the main façade of the Palazzo Ducale, Urbino, where Luciano Laurana was employed (p. 6 and pl. 3j). ^ These earlier appearances were adduced by Davies and Hemsol 1983:7f. ^ Davies and Hemsol 1983:1. ^ Twist-turned legs on a backstool feature prominently in a conversation piece of a couple in an elaborately fashionable Dutch interior, painted by Eglon van der Neer (1678): illustration. ^ The architectural invention of the applied half-baluster, with a caveat concerning "the fallacy of first recorded appearances", by Filippino Lippi in the painted architecture all'antica of his St. Philip revealing the Demon in the Strozzi Chapel, Santa Maria Novella, Florence, and in Michelangelo's planned use in the Medici Chapel, is explored by Paul Joannides, "Michelangelo, Filippino Lippi and the Half-Baluster", The Burlington Magazine 123 No. 936 (March 1981:152–154). ^ "There are no free-standing baluster columns of Shah Jahan's reign in the Fort at Lahore", according to Ebba Koch ("The Baluster Column: A European Motif in Mughal Architecture and Its Meaning", Journal of the Warburg and Courtauld Institutes, 45 (1982:251–262) p. 252) but balustrades are a feature of all three. ^ "AskOxford". Archived from the original on 2007-09-29. Retrieved 2007-06-26. ^ "banister". Retrieved 28 April 2018 – via The Free Dictionary.